Despite a deliberate, unhurried manner and captivatingly clownish demeanor, the Basset Hound possesses great intelligence and what may often be viewed as stubbornness may more appropriately be attributed to an innate ingenuity. In fact, the Basset excels at getting his way, from “demanding” a tasty morsel at the table to hurling his hefty 65 pounds into your lap! His overly long body, short legs, and delightful wrinkles become a kaleidoscope of amusing expressions, all cleverly orchestrated to win us over. And win us over he does. Gentle and sociable in nature, the easy-going Basset Hound is loyal to master and family, devoted to children and mild-mannered and friendly towards other animals. Gets along well with people and other dogs and pets. Good with children. Loves to be a lap dog. Not a good guard dog. A Basset takes punishment and reprimands to heart. Can be stubborn and conveniently “hard of hearing.” Pack mentality. A single Basset may not do well left alone for long periods. For working owners, the company of another dog is the next best thing to having you there. 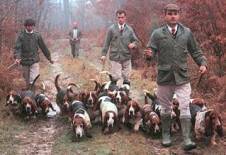 The Basset was bred to trail game. His keen nose can lead him into dangerous situations such as the path of a speeding car or an unfenced swimming pool. The Basset is safest in a secure, enclosed area. Prone to obesity. Healthy, trim Bassets have good energy levels, but they are also content to snooze away the afternoon in a patch of warm sun. Although this laid-back nature makes them desirable house pets, their weight must be kept in check. A daily walk with your Basset is recommended. A large, hefty dog, possessing more bone for its size than any other breed of dog. Although Bassets are low to the ground, they are not small dogs, with most ranging from 50 to 65 pounds. The average person will have a difficult time lifting an adult Basset Hound.A smooth-coated dog. A wash-and-wear dog who may be bathed as frequently as needed. Bassets are either tri-colored (a combination of black, white and tan) or red-and-white (a lighter red-and-white may be called lemon-and-white). Coat colors are distributed over the body in no particular pattern. Growing puppies have special needs. Until they are a year old, Basset puppies should not go up and down long flights of stairs or be allowed to jump on and off elevated objects such as couches, beds or porches. The joints of this heavy-boned breed are still forming and excessive stress or strain may cause permanent injury. After a year of age, these activities, within reason, are usually not harmful to your Basset. Short legs may mean a needed boost! Many, but not all, sturdy, low-slung Basset Hounds may require assistance getting into a car. The unique, low-stationed Basset does not excel at jumping. Long ears and droopy eyes need cleaning. Nails need trimming.